Entries to our Mid Winter quiz are beginning to arrive, do keep them coming! Don’t forget that you have until February 22nd to submit your efforts (no, it’s really NOT that hard!) by email to kate@walksweeks.com. In the meantime here are some wintry pictures from the past couple of weeks. And a final cold bird! 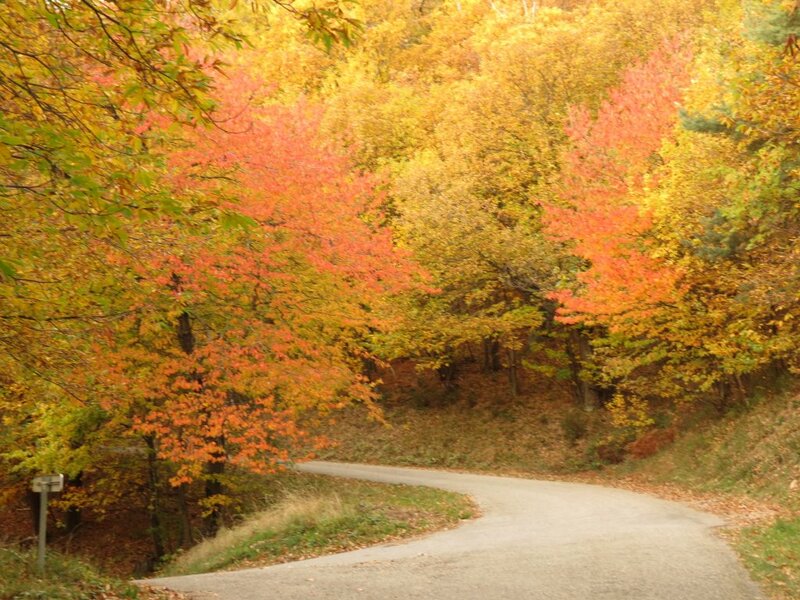 Autumn is here and the brilliant golden flash of the mullberry trees illuminates the coutryside, contrasting with the orangey hues of vineyards and apricot orchards, the rosy russet of the cherry trees and an occasional vertical yellow stroke of a lombardy poplar. We have been meaning to write about the mullberries for a while now but, whilst researching the history of silk production in the Ardèche I realised that the subject is too vast for just one post, so here is the first of a series we’ll be writing over the autumn. We hope that you will find them interesting: it seems worth giving this important aspect of our area’s history the attention it deserves. If you know les Sarziers, you may well have have slept in the Pink Room, with its large window overlooking the courtyard, and you will have noticed a corner cupboard opposite the bed. These two elements are not as mundane as they may at first appear. When we bought the house, this section of the barn was divided off into a rectangular space running the whole width of the building, with two corner fireplaces, without chimneys. We were told that this was the magnanerie – a place to raise silk worms. For silk worms to survive and thrive a constant temperature of around 23C, fresh air and plenty of light are essential. Traditionally Ardèche houses are very dark, with tiny windows, so it was necessary to create a large opening to provide light and ventilation and to install the little fireplaces, which were presumably supplied with the hot embers from the main fire in the kitchen. We redesigned the space to make the bedroom, bathroom and larder, where one of the fireplaces is still located. The happy discovery of an old door in a brocante enabled us to turn the other one into a corner cupboard and to complete the transformation of this …. Silk worms, or Bombyx mori to give them their official title, are fussy little beasts and will only eat fresh, shredded leaves from the white mullberry tree, which they devour in vast quantities. Gnarled old trees are still to be found close to all the farms. Sometimes grown along the access lane, their roots have gradually forced their way through the dry stone walls, causing them to collapse. Wherever there is a ruined homestead there will be mullberry trees, doggedly surviving where all the other life of the farm has vanished, silent witnesses to a boom and bust which profoundly marked our area. 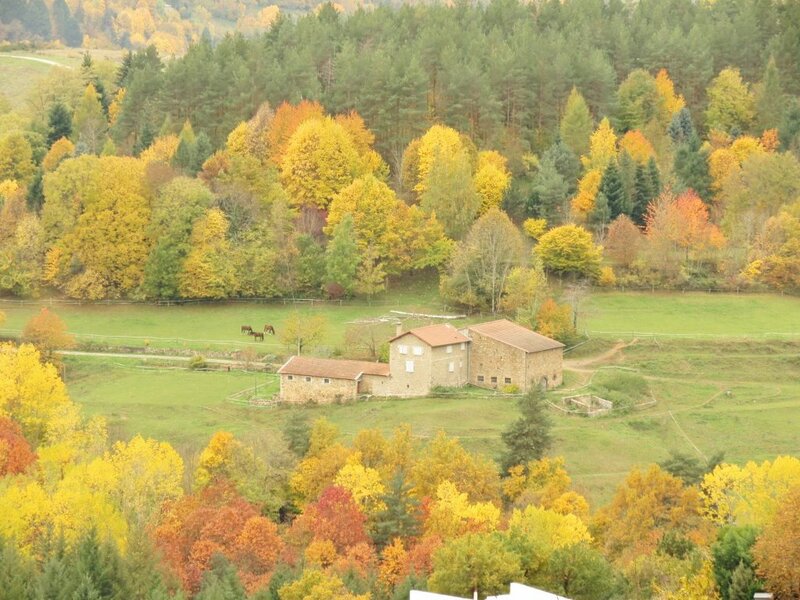 The Ardèche was always densely populated but conditions for subsistence farming are harsh. The land is often stony, the soil shallow and the gradients steep. Over many centuries, terraces were painstakingly constructed, retained by dry stone walls, to provide fertile patches on which to cultivate potatoes, kale, and cereals. These were small-scale mixed farmers, raising a little livestock: goats, a few cows and a pig or two, poultry and rabbits. They were self sufficient by necessity, but often lacked the means to generate cash for other basics. 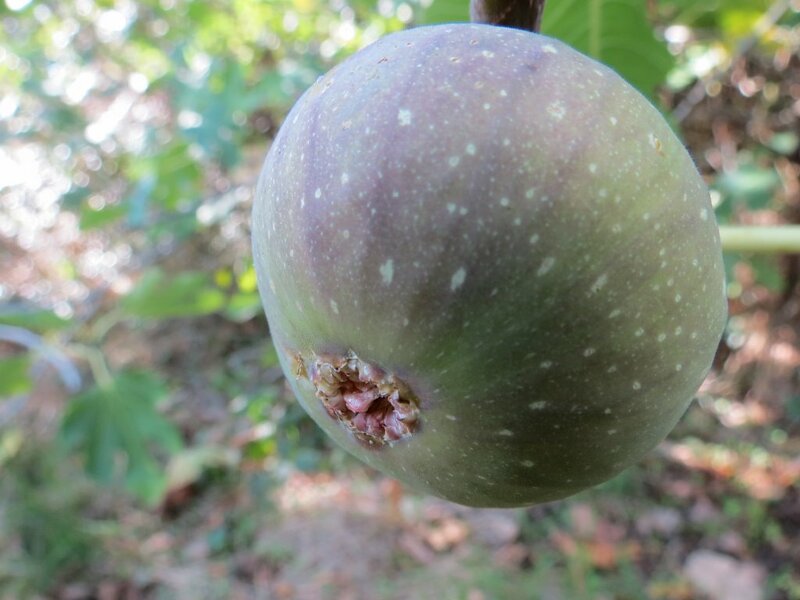 But they also grew wine and chestnuts, which could be sold commercially if the harvest was good, to provide a minimum cash income for the family. Wherever possible, farmers planted a little vineyard and made their own wine and any surplus could be sold to villagers at higher altitudes where vines wouldn’t prosper. Sweet chestnuts could be easily cultivated. They were an essential part of the diet and also used as fodder, with any excess being sold to generate cash. But the real cash earner was the silk worm and artisan raw silk was being produced in the Ardèche by the 1700’s. Although the demands of our little friends bombyx kept the whole family occupied round the clock for a period of four or five weeks in May, other farm work was relatively light at that time and no other crop could be grown and harvested so quickly. To get an idea of the complex and time consuming process of rearing silk worms it is worth taking a quick look at their life cycle. After the incubated eggs have hatched, the silk worm eats voraciously for 30 days or so, passing through five growth stages and shedding its skin four times. It will then begin to pupate, by spinning a cocoon, inside which it gradually metamorphoses into a silk moth …. or at least that is what it hopes to do! But before the transformation is complete, the pupa is killed and the silk filaments unwound. If the moth had been allowed to break through the cocoon and emerge the filaments would have been snapped into short pieces, so unfortunately thousands of creatures had to be slaughtered to make that beautiful silk scarf you love! The process began in chilly mid April when the mullberry trees were beginning to come into leaf. Silk moth eggs require a constant temperature of around 23 C to incubate and they were traditionally kept, either close to the bread oven which was part of every little hamlet, or placed in cloth bags which the women wore under their clothes. After about a fortnight, the eggs were laid out on slatted wooden trays, covered with a loosely woven cloth which was spread with finely sliced mullberry leaves. The emerging silk worms passed up through the cloth and started to feed on the leaves. The next few weeks saw constant and hectic activity. The worms have to develop at the same rate, so the last hatchings need to be moved closest to the source of heat and light. They also must be spaced out so that each has access to the right quantity of food. Hygiene is crucial, and after each moult the soiled bed of leaf litter must to be carefully removed and destroyed. Silk worms require regular meals, served four times a day (so French!) and the quantities are enormous: according to Wikipedia 30 grammes of eggs will, as worms, consume 1,300kg of leaves over a period of around 32 days. When the worms were ready to pupate, little cages of heather twigs were prepared into which they climbed to begin their transmogrification – and to seal their fate. Silk worms secrete a gummy substance from the salivary glands, working in a figure of eight movement until their body is entirely wrapped, and the filaments harden in contact with the air. Now for the sad bit! A large cauldron of boiling water was set up over an open fire in the courtyard into which the cocoons were dropped in batches. As the gluey substance began to soften the filaments were unwound, combining the threads from around ten cocoons together into a single strand and taking up a new cocoon as necessary, so as to produce a continuous thread, which was wound into a skein weighing around 120 grammes. This is raw silk, or soie grège in French, from the word grès, meaning the gluey substance. The hanks are called flottes, which nicely evokes the airy, brilliant texture and look of natural untreated silk. For the hard-pressed farmers of the Ardèche this almost magical process must have seemed a little like Rumpelstiltskin in the fairytale, who could spin straw into gold. The very definition of a cash crop, their flottes, produced in the simplest of conditions, were destined to be woven into the rich brocades and jacquard frabrics for which Lyon was so famous, and to clothe royalty and the opulent bourgeoisie. But, between those two extremes lay one further step …. Things have been pretty hectic around here recently and the news is stacking up, but it’s time to backtrack a little and tell you about the exciting new developments at Morlanche. We are so thrilled to have Brice and Lisa as our neighbours. Since Brice’s grandparents moved to sheltered accommodation eight years ago their house has been empty and things haven’t felt the same. 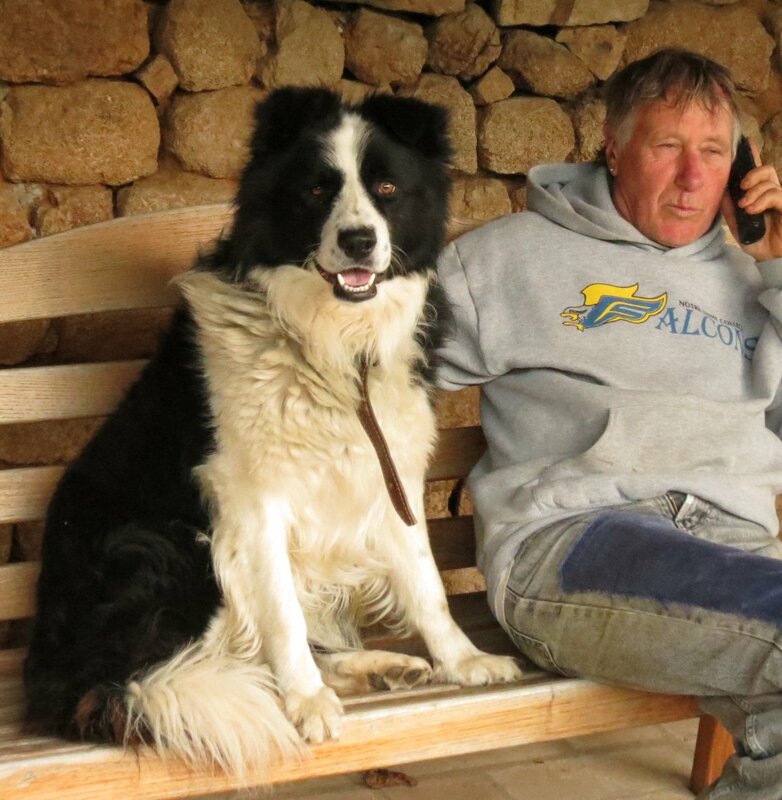 We bought our house from them and we have developed a close attachment to the family, so when, after the old couple had passed away, Brice decided to move to Morlanche and to revive the vineyard and traditional wine making activity we could not have been more delighted. They have been here for just over a year and in that time so much has been achieved. 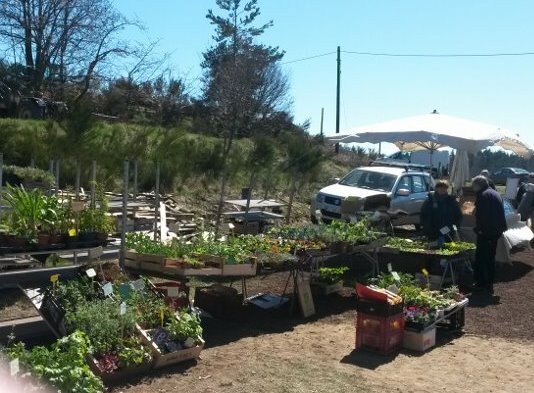 Brice has completed a course in winemaking and vineyard management and Lisa has done an incredible job renovating the house and getting an amazing vegetable garden going. Together they have been systematically rejuvenating and encouraging the vineyard, using natural methods and a minimum of chemicals and their efforts were rewarded with a bumper crop of excellent quality Gamay when the time came round for the vendange. The weather had been warm and sunny, the grapes were testing well for a projected alcohol content of 13% when Brice made a snap decision and called the vendange for Saturday 24th. A small band of family, friends and neighbours spent a hot but very cheerful day harvesting what turned out to be just under 500 kg of grapes. However, what made this vendange really special is that, for the first time in 40 years, the grapes weren’t sold on to a local wine maker, but taken to the vast cellars under the house to be trodden, before being poured into the vat to start their journey towards becoming the cuvée Morlanche 2016. Treading is next – a messy business! Into the vat . . .
There’s still a long way to go and constant monitoring, testing … and tasting are required. But the old cellars are once again filled with the wonderful aroma of fermenting grapes – Brice says that you can even smell it in the kitchen – and the centuries’ old tradition of wine making at Morlanche lives again! Ma Rosalie, titipanpan, elle est malade, Elle est malade, titipanpan, du mal d’amour. Pour la guérir, titipanpan, faut d’la salade, De la salade, titipanpan, trois fois par jour. This silly little children’s song, which continues merrily on, with several changes of rythm and theme, has been running through our heads as we contemplate our unusually successful vegetable garden. After a wet May and June and a month of July with weekly thunderstorms, the vegetables look promising these days. But we are confronted with the usual gardener’s conundrum. Why does everything grow at the same speed and is ready to be eaten the same day? Even with successive sowing the cucumbers, courgettes and the green beans are all ready to be picked at the same time. But by far the worst in the category of “We want to be picked – eat us NOW otherwise we’ll sulk and bolt” are the salads. Now for the serious part – the answers to last week’s quiz. Thanks to those of you who took part! Pieds et paquets – a provençal speciality made with sheep’s feet and stuffed sheep’s tripe. Sometimes euphemistically called roupettes de coq, these are exactly what they say on the tin – or more usually the jar. Alouettes sans tête, literally larks without their heads, are actually a provençal version of beef olives. Tête de Moine or Monk’s Head is a cheese from the Swiss Jura but very much appreciated in France. The autumn colours are magnificent this year, which is rather a surprise since we had thought that the unusually hot dry summer would have burned the leaves to a crisp. In fact, compared with the last great drought of 2003, it was noticeable that although no rain fell from May to September, last year’s miserably wet summer and high rainfall over the winter had boosted the water table to such an extent that the vegetation remained relatively unscathed despite the fact that the topsoil was completely dried out to a considerable depth. Anyway, we thought we’d go for a walk and get some pictures of the spectacular show. 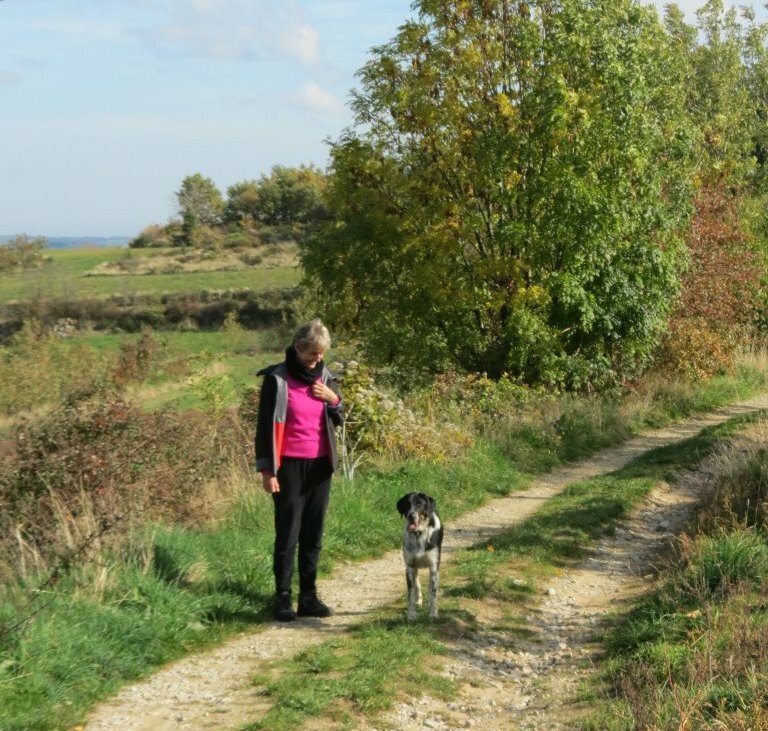 We set out along the route of the Rando Croquis, adding in a few variations of our own and, just as we were having a word with a friendly donkey, we noticed an enthusiastic and amiable dog bounding up the lane towards us. We passed by his house but he showed no interest in returning home and, since our walk was a circular one, we decided that there was no harm in letting him accompany us: we could drop him off on our way back. He turned out to be the most delightful company. A young dog, curious and interested in everything, he was constantly distracted by butterflies, interesting smells, and intriguing holes in the bank which needed investigating. 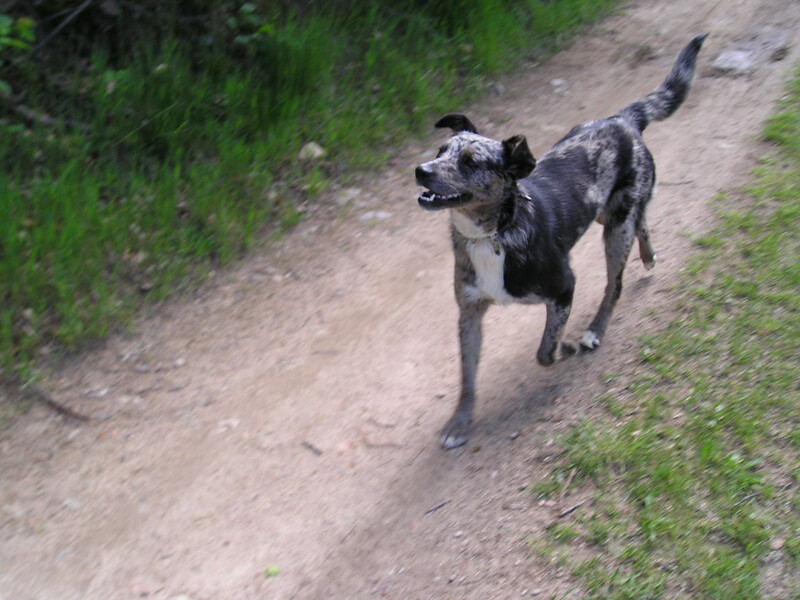 We christened him Thunderpaws because of his habit of racing up at top speed from one of these interludes and crashing between us in order to get ahead and lead the pack as any self respecting dog should do. 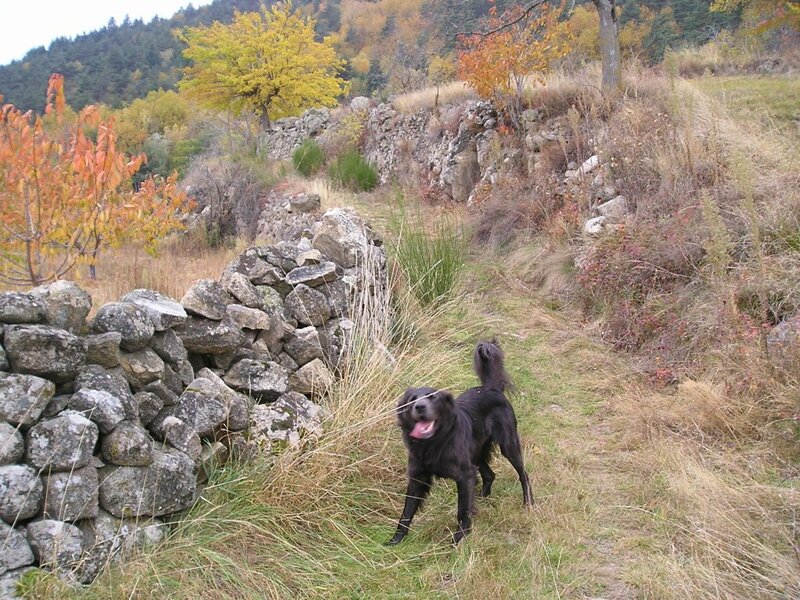 His personal habits were somewhat disgraceful – he triumphantly retrieved a very bedraggled dead rabbit from his cache in a cherry orchard and brought it to us for our inspection and he tended to roll in anything nasty he came across – but he was fun, alert and responsive. He behaved impeccably when we walked through the village, resisting provocation by a fenced-in Rottweiler and heroically ignoring the demented growls, howls and barks of assorted hunting dogs trapped in their enclosure. Thunderpaws got rather impatient when we stopped for Markus to take these great photos and showed no interest in collecting walnuts but he generally found enough to amuse himself and we got him home by lunchtime. It’s not the first time that we have been temporarily adopted by someone else’s dog. This one met us at the Col de Fontfreyde when we were doing early mapping out of routes in preparation for the launch of Walksweeks. We were in the middle of nowhere but the dog took our appearance totally for granted and simply set off with us on our walk. After an hour or so he waved his tail in farewell and cut off through the woods down to his farm way below the track. We did not know him long enough to give him a name. Bounce however, became something of a friend. He bounced out at us from his house in the forest, where he was obviously getting bored, and simply refused to return home. 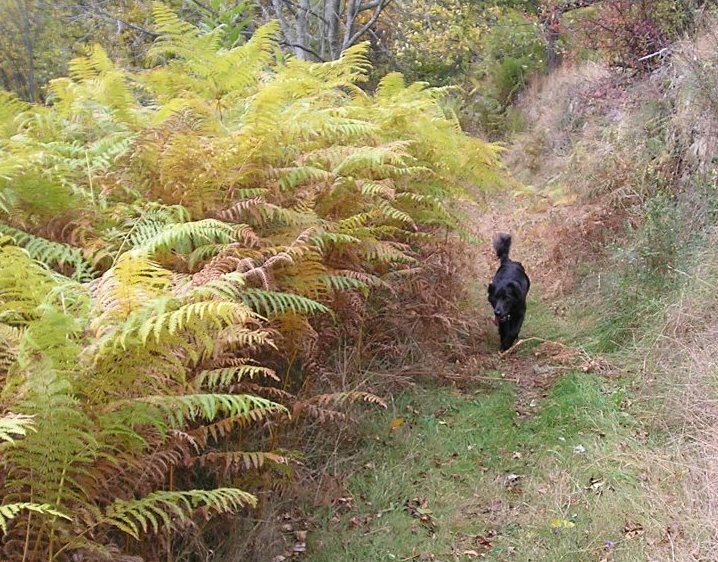 We were at the furthest point out on a very long walk but there was no persuading him. He just bounced along in front of us, delighted to be going wherever we were. Apart from disgracing himself with some chickens as we passed through a farmyard he was no trouble at all and three hours later we all fetched up at les Sarziers, where he drank a large bowl of water and looked around to see what would happen next. We found the phone number of his owners and suggested to them that we could bring him back in our car, which we did, Bounce taking the whole adventure totally for granted and sleeping soundly throughout the journey. The following Spring we were amused to see party of Walksweekers returning from the same walk with Bounce in tow! We drove him back once again to the house in the forest and this time were rewarded with a huge bag of Valrhona chocolates – his master works in the lab there. This lovely fellow was waiting for us in Roger’s field one evening when we returned from a few days away. As soon as we got out of the car he joined us in the courtyard with an air of “I wondered when you were going to show up” and quickly made himself at home, whilst returning to pay his respects to Roger several times a day. Roger said he had just appeared out of nowhere and taken up residence in the barn, contentedly sharing accomodation and rations with the cats and treating Roger’s own dog Tango with suitable deference. He was a beautiful dog, but a bit large and getting to look rather permanent so we made some enquiries. 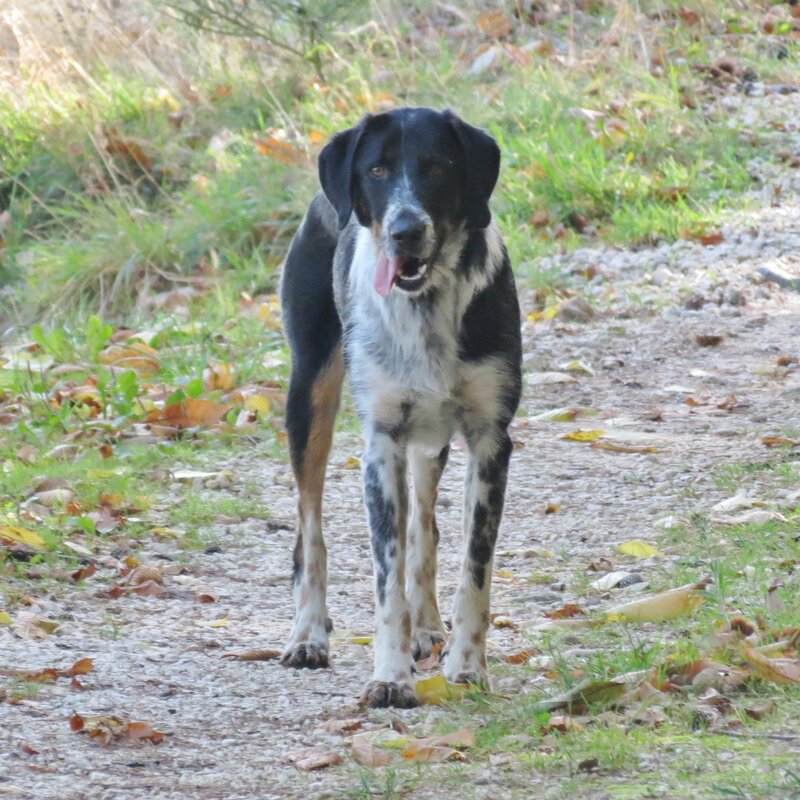 It turned out that his original owner, an elderly farmer living alone, had moved to a retirement home and had given the dog to his nephew in St Félicien. City life held no charms for the dog however; he had set off in search of a home similar to the one he had always known and had fetched up chez Roger. Happily a satisfactory outcome was found and residential arrangements made for him with a farming cousin. We were a little sorry to see him go but we are realistic enough to know that it is just not practical for us to have a dog of our own, much as we would like one. So for the time being we enjoy someone else’s Best Friend tagging along with us for a while. As we come to the end of the fruit harvesting season at Les Sarziers, the battle between the flying creatures and humans has taken on bigger proportions. The hornets and wasps make a bee line (sorry) for the grapes, and figs seem to be a favourite desert for the entire Ardèche bird population. It is a 24 hour job to keep the attackers at bay. After some lengthy stints flapping and swatting we decided to look for methods that would work in our absence. This is were le Système D comes in handy. Système D is an abreviation for Système Débrouillard (De-fogging system). “Tu te débrouilles bien” is one of the highest forms of praise on offer in the French language. It means that even in adverse situations you will find a way out of the mess you are in and get on with your life. “Débrouiller” is often replaced by the more vulgar but by no means less effective verb “Démerder”, which starts with a “D” as well. So it is up to you to decide what Système D really stands for. To come back to the insects and birds: You are looking for a cheap version and efficient weapon, so recycling comes to mind, which is at the core of the Système D. Cut off the top of a plastic bottle, turn it upside down, insert into the base of the bottle, make two holes on the side, fill it with (inferior) beer and apple juice, et voilà you have your death trap for wasps, hornets and flies. You can sleep again. Or can you? In our case the hornet army was too big and even though we collected more than 100 hornet bodies in the bottles they still won the battle. So with Système D in mind, we decided on defensive warfare, and the bunches of grapes that had not been eaten by the nasty stripy buzzers were placed individually into croissant bags. Laborious, but it worked. The grandchild of one of our friends asked us why we were hanging up croissants in the vine, proving that from the tender age of five, a French person will always be able to recognise a croissant bag. Now as for the trees. 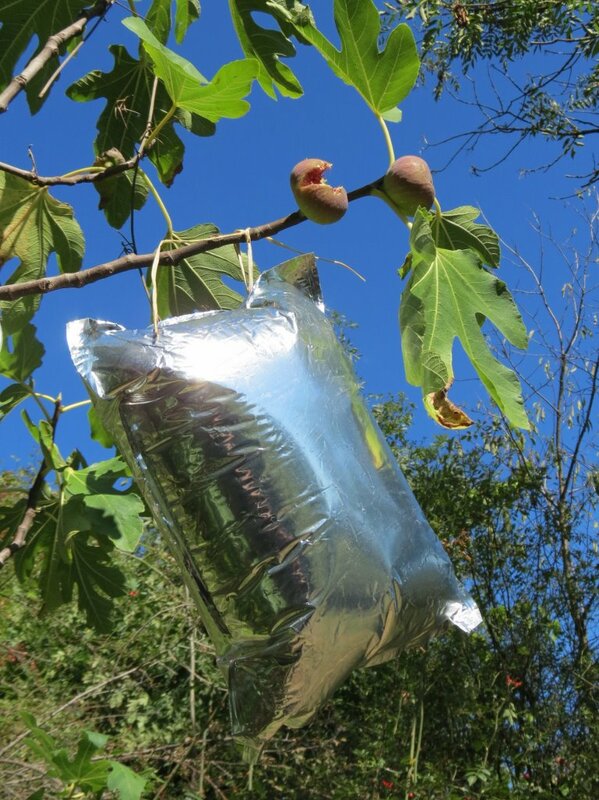 Everybody knows the trick with the CDs attached to the branches of your fruit tree. But wait for France’s answer. 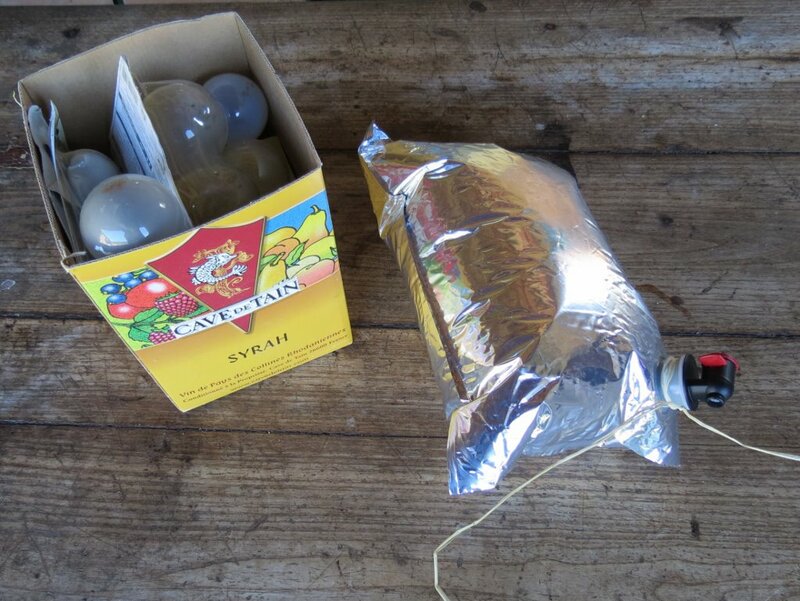 Buy a bag-in-box (or several), organize a party, drink the wine, cut up the box, which will be ideal for storing light bulbs, extract the bag, blow it up and you have a silver ballon that will make CD’s look – what they always looked like – the interior of a burst rubish bag blown into a tree. 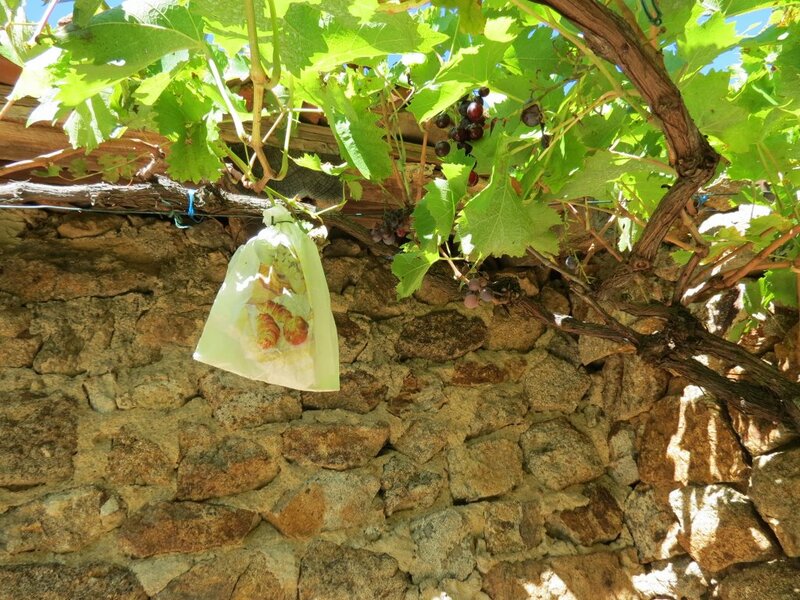 The chic way of chasing away the birds is a bag of Crozes Hermitage 2011. 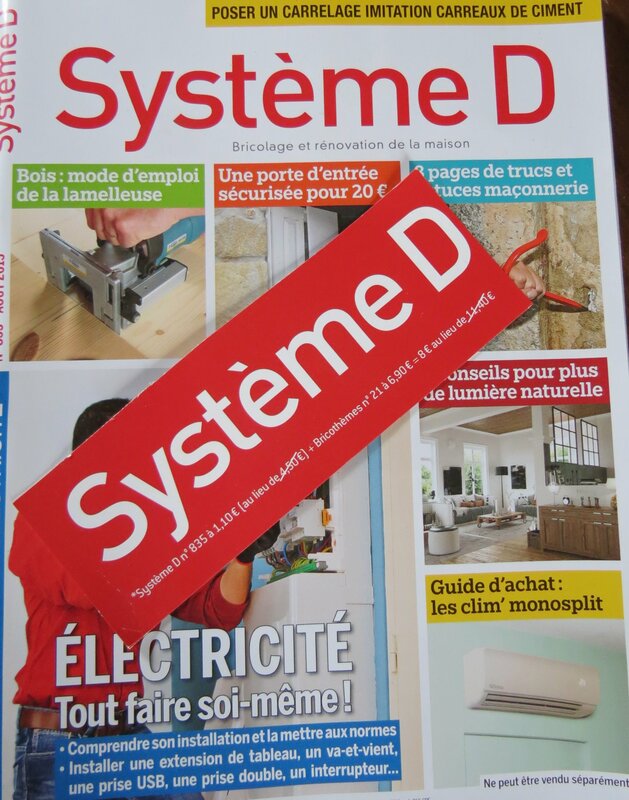 There is a magazine titled Système D, which in fact is a brilliant monthly publication for DIY freaks giving you heaps of information how to build your house, restore your house, demolish your house, rebuild your house, tile your floors, your walls, your roof and of course how to make wasp traps. My favourite suggestion I remember from a previous copy was a way to make a fruit drying rack out of a car radiator. There is a readers’ column where you find endless ideas how to transform empty water bottles into a useful objects. Here are some examples. All this does rather confirm France’s 1970’s slogan – still popular now : “La France n’a pas de pétrole mais elle a des idées“. (France has no oil but we do have ideas). Or as we Swiss say – We have no oil either, but the flag is a big plus! 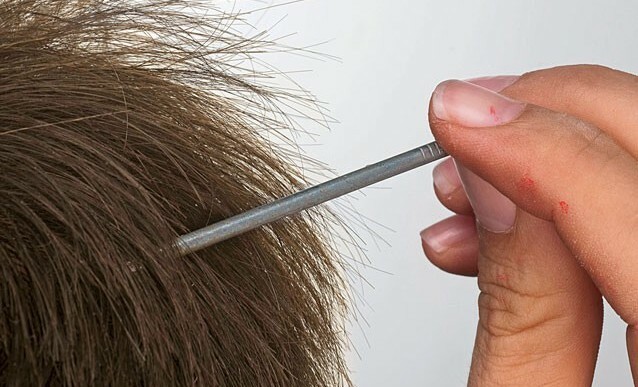 Addendum: This is not Vlad the Impaler at work, but – according to Système D – the best way to lubricate the tip of a nail to avoid the wood splitting. “Köpfchen” – as we say in German! 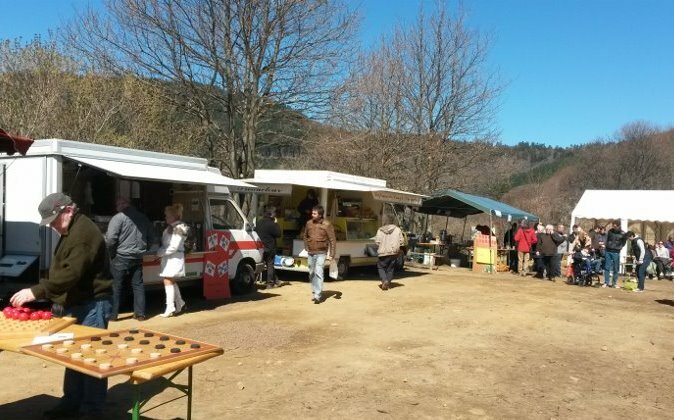 I went up to an occasional farmers’ market yesterday at les Fauries above Arlebosc. As I was walking towards the action I overheard a pair of ladies remarking “we ought to have brought a knife, there are some really good dandelions up here”, and indeed there were! It was a gloriously sunny day though with a stiff northerly wind. The apricot trees are beginning to flower and the grass is shooting up, but it’s still chilly when the sun goes in (what my mother used to call “the blackthorn winter” and indeed the blackthorn is in flower). Spring is on its way and it’s time to eat our bodies into shape. In Britain, after the excesses of the midwinter bacchanalia, the papers are full of detox plans and slimming advice, shortly to be followed by the anti detox columns which point out that it is January, and the dead of winter. The days are short and dark, the weather is horrible and it hardly seems the right moment to put one’s body under such stress. Whereas in Mediterranean countries people are still eating warming soups and stews at this time of year. After all in France Christmas and New Year dinners centre around oysters, smoked salmon and champagne and if you steer clear of the yule log (which isn’t hard to do) your waistline won’t come to much harm. Midwinter is the time to make pot-au-feu, boeuf en daube, pintade au chou, smoked saucisse de morteau with white beans, and other heartening fare. The detox comes once nature begins to reawake and the first bitter shoots and herbs appear as the days grow longer. Then you will find people out in the fields and on the hillsides, sharp knife in hand, cutting dandelion roots and shoots, early lambs lettuce, chicory and, a little later, wild asparagus. The idea is to purify the blood and prepare the body for the move outdoors again into the Spring sunshine, which is often considered to be dangerous. In Milan last week in our other life as tour guides, we had a delicious simple Spring salad made of thinly sliced raw artichokes and parmesan shavings in a light oil and lemon dressing. 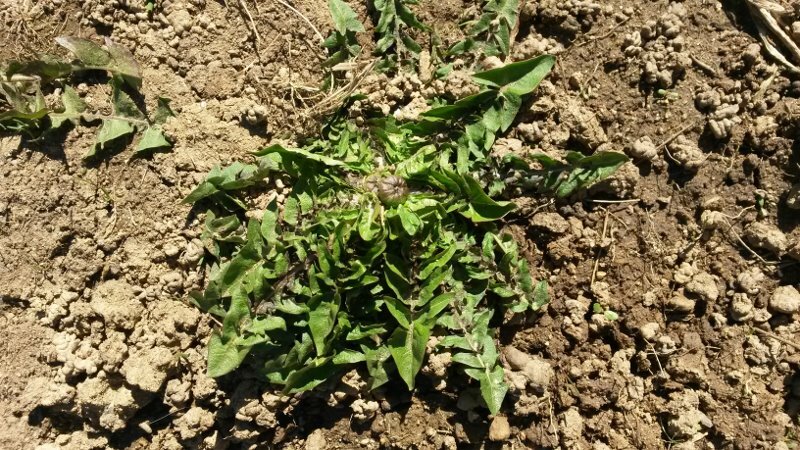 I won’t be able to find those tiny artichokes here for a while, but dandelion salad, although a bit of a fiddle to make, is definitely on the menu, as is nettle soup. The lady who took us collecting dandelions many years ago explained that you should cut them when the rosette of leaves is still flat to the ground with a small flower bud in the centre. She showed us how to run a sharp knife around the base and lift a little stalk, which gives a delicious nutty flavour to the salad. You scrape and clean the base as you would do for a mushroom and then split the plant in two. Wash the leaves carefully and trim them to a convenient size, discarding any which are too large and tough. (Some people recommend heating the salad bowl if the leaves are too bitter but this shouldn’t be necessary). Dress the salad with a sharp vinaigrette made with wine vinegar, a little oil, salt, pepper and finely chopped shallot. Toss well and top with diced hard boiled egg. Nettles are a good source of iron and magnesium, they are said to help with rheumatism and have a diuretic and purifying effect on the body. To make the soup, pick a pound of young nettle leaves (carefully, although when very young they do not sting) and make the soup with an onion, potato, garlic and stock in the usual way, puréeing it at the end. By the way it struck me that in Welcome to the Free Zone, Mme Hermelin is not being entirely idiosyncratic serving nettle soup to the guests at her pension, but the authors, who never miss a trick, are subtly underlining her tight-fistedness since it is far too late in the season for nettles to be palatable, no doubt the reason why her husband has to chop them up. As Victor Hugo observes in Les Miserables: Quand l’ortie est jeune, la feuille est un legume excellent, quand elle viellit elle a des filaments et des fibres comme le chanvre et le lin. Hachée l’ortie est bonne pour la volaille; broyée, elle est bonne pour les bêtes à cornes. (Young nettle leaves make an excellent vegetable but older ones are as tough and fibrous as hemp and flax. Chopped up they can be fed to poultry and if mashed to cattle and other horned animals). These guys obviously know what’s good for them! Our almond tree is wearing its wedding dress again. It is time to say goodbye to the freezing winds and early frosts. Now the first tree is in flower, so let’s celebrate the beginning of spring! 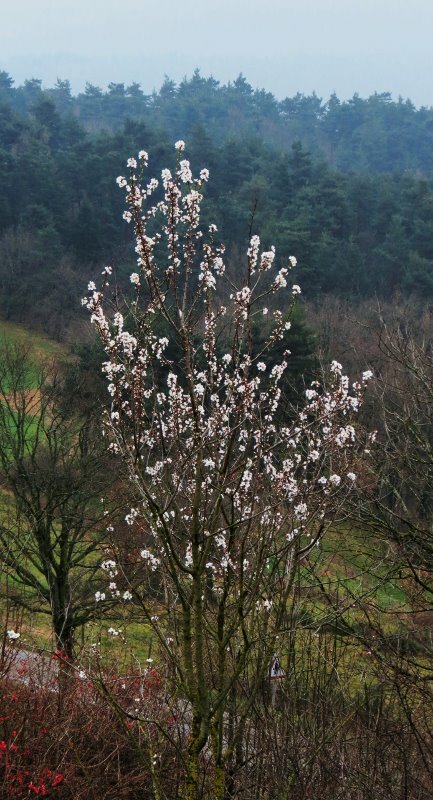 Even though we are not in a an almond growing area (in fact France as a country isn’t, which makes you wonder about all those almond specialities like frangipane, calissons d’Aix, sacristain and others), there is the odd almond tree scattered around the Doux valley. You wouldn’t notice them during the rest of the year, but now it is their moment, when they show off their pinkish white dresses. They stand out like patches of pure snow in the grey countryside. 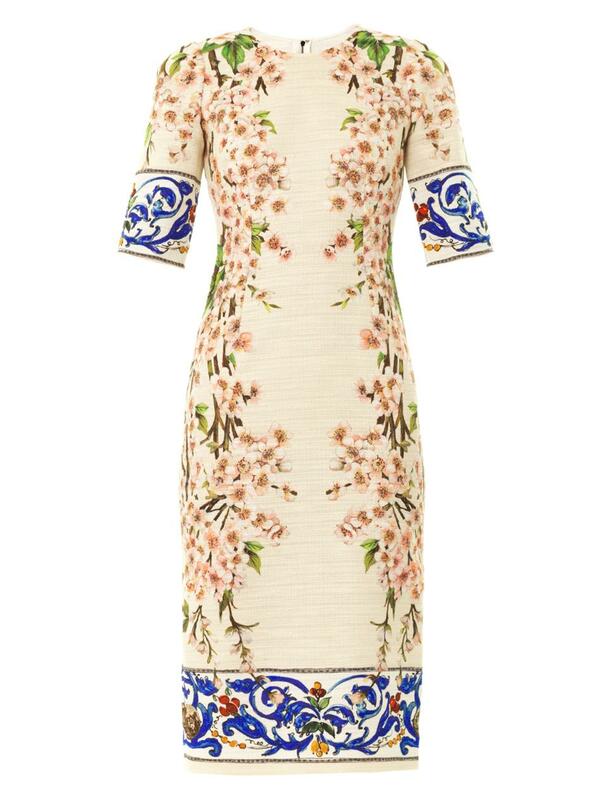 and that it has inspired fabric patterns and fashion designs, for example this gorgeous dress by Dolce and Gabbana. 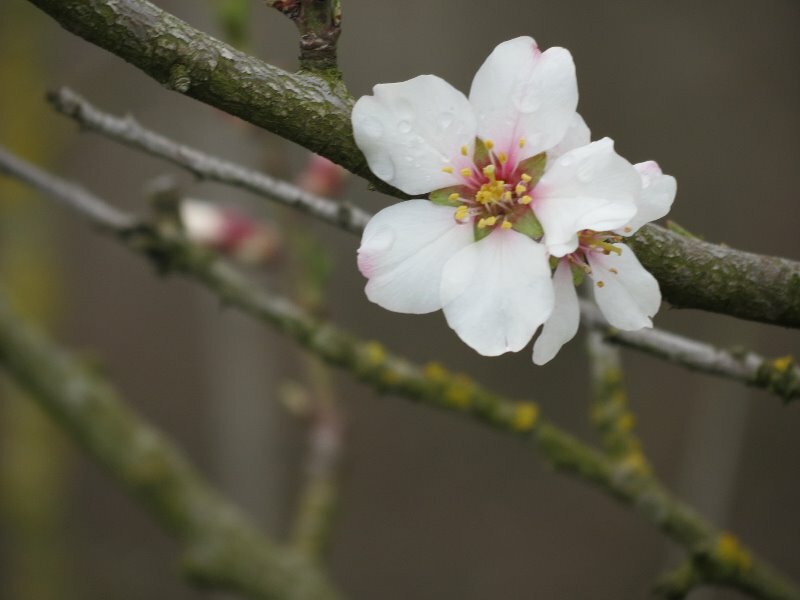 In literature the almond tree is often used as a symbol for love and virginity, an idea which is probably rooted, (literally) in the original myth linked to Saint Valentine, the saint who is responsible for the comercial fiesta in February. The girl whose eyesight he had miraculously restored fell in love with him, but sadly, like most early saints, he was martyred and that was the end of that. 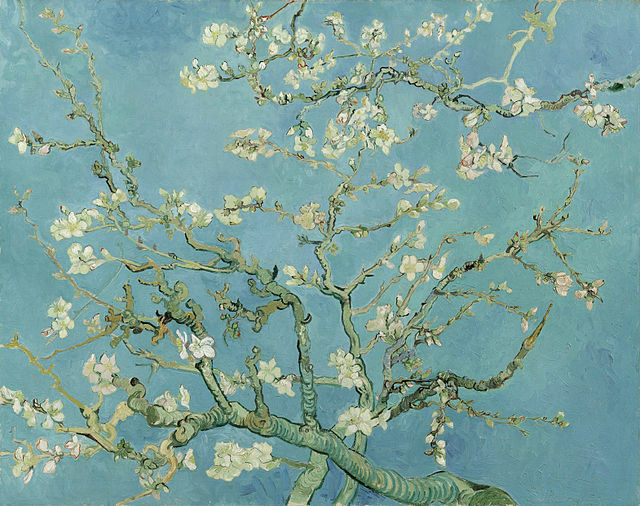 According to legend, the desolate and virtuous maiden planted an almond tree on his grave. You can just imagine her in the Dolce and Gabbana dress! From the 7th to 22nd of March France is celebrating the seventeenth Printemps des Poètes and the above poem by the Palestinian writer Mahmoud Darwish is our small contribution to mark this event. Although we have no pretentions to being in Provence as the term is now understood, the Haut Vivarais where we are was well within the historic region of Languedoc. It took its name from the southern language, of which provençal was one dialect, which finally lost out to the Langue d’oil of northern France when the area came under the control of the Frankish kings, who decreed that theirs was to be the single official language. Along with speech, now mostly differentiated solely by the charming southern twang, there are specific traditions belonging to the south one of which is the Treize desserts de Noël. 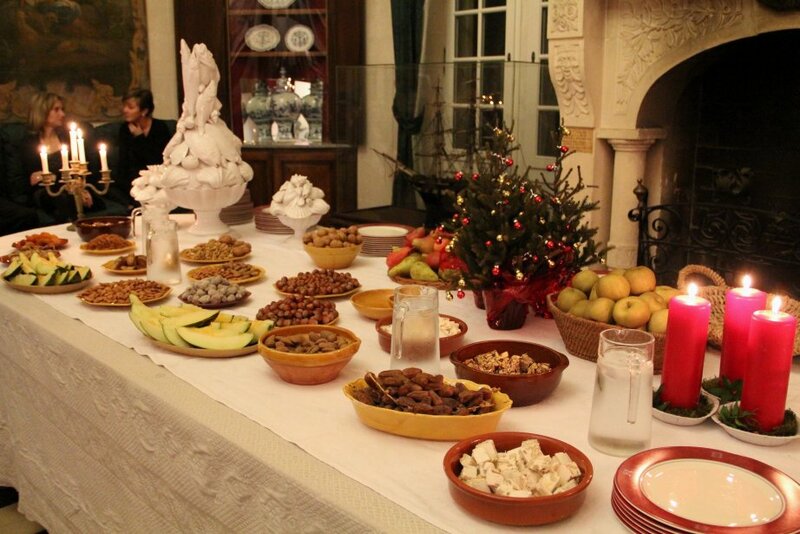 At the time of Louis XIV the people of Marseille used round off their big Christmas meal le gros souper du reveillon, held on December 24th, with all kinds of fruits and sweetmeats, together with twelve small bread rolls and a large one, to represent Christ and the apostles. This was perhaps just a marseillais tradition but all over Provence you would find the four “mendiants”, or pachichois in occitan, which have been eaten since Medieval times at Advent, Lent and Easter, representing the four mendicant religious orders, with walnuts for the Augustinians, almonds for the Carmelites, dried figs for the Fransiscans and dried raisins for the Dominicans. Another provençal speciality is the “pompe à l’huile”, a kind of brioche made with olive oil, flour and orange or anis water which must be broken as at the Last Supper, and not cut, for fear of bankruptcy in the year to come, together with fougasse, a flatbread made with olive oil and usually shaped into a rough rectangle and slashed to resemble an ear of wheat. These different elements were formalised by Frédéric Mistral, father of the renaissance of the provençal dialect and gradually became known as the “traditional 13 desserts”. There is considerable argument about which thirteen items should be included but it is generally agreed that the essential ones are: apples, green (or winter) melon, pears, grapes, white and black nougat (symbolising good and evil), the four mendiants and the pompe à l’huile. Some variations are permitted, for example candied fruit, such as cedrat, chestnuts, quince cheese and grape or fig jam and oreillettes – wafer thin morsels of fried dough flavoured with orange water. 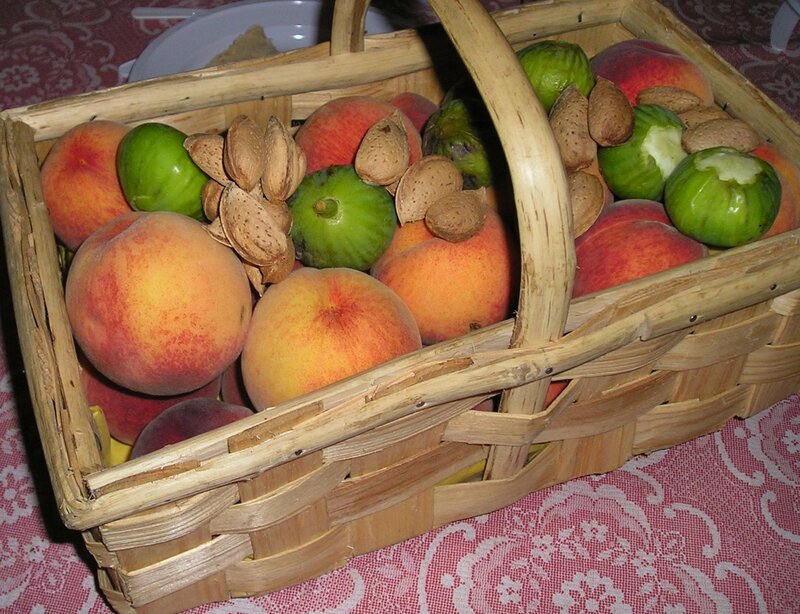 The only non native fruits allowed are dates and oranges which evoke the flight of the Holy Family into Egypt and certain local delicacies may be granted a place at the table, such as the little lozenge shaped almond sweets from Aix, called calissons. The thirteen desserts are served either before or after midnight mass on 24th December, on a table decorated with three candlesticks representing the Trinity. They stay on the table until the 27th. All thirteen must be presented at the same time and guests must sample each item. Frequently children are not allowed to start until they have named all thirteen.